Swinging Ball Test of MaxSonar Rangefinders | MaxBotix Inc. The primary goal during the building of the original LV-MaxSonar-EZ1 was to make a high-performance ultrasonic range finder that provided readings, so stable, that unless the object moved, the readings didn’t vary. These goals have continued and been improved upon for all of our subsequent products. MaxBotix Inc has virtually reached that goal. 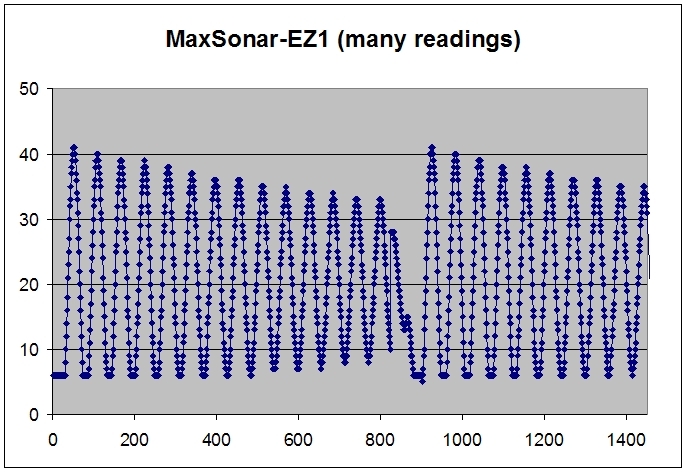 The original LV-MaxSonar-EZ1 ranges objects between 6” and 254” and objects closer than 6” report 6”. Below is an actual plot to a swinging ball showing the stability of readings provided by the LV-MaxSonar-EZ1. Figure 1.1 is taken with an LV‑MaxSonar‑EZ1 sensor, where the sensor measures the distance to a swinging ball. Every reading is correct and the only place where the data is uneven is the place where the ball is picked up (about reading 850) and started the test over again. The LV‑MaxSonar‑EZ1 is a sensor that provides data that you can trust. MaxBotix Inc wanted to provide a sensor that was better than the others. Range stability was the primary goal. All other goals were either required to meet this primary goal or were secondary goals. The data in Figure 1.2 was taken from our report titled, Pendulum_Test_Results.pdf, located on our Performance Data web page here testing showed how well the LV‑MaxSonar‑EZ1 and the LV‑MaxSonar‑EZ1 meet this goal. “Better than other” sensors is subjective, but real-world testing is not, so we are showing data from other sensors to tell the difference that an end user might see. We did not test the sensor with the SRF01 and the SRF05 because the sensor was not available for testing. This test was conducted using the original MaxSonar-EZ1 and Devantech SRF02, SRF04, SRF08 and SRF10 sensors. 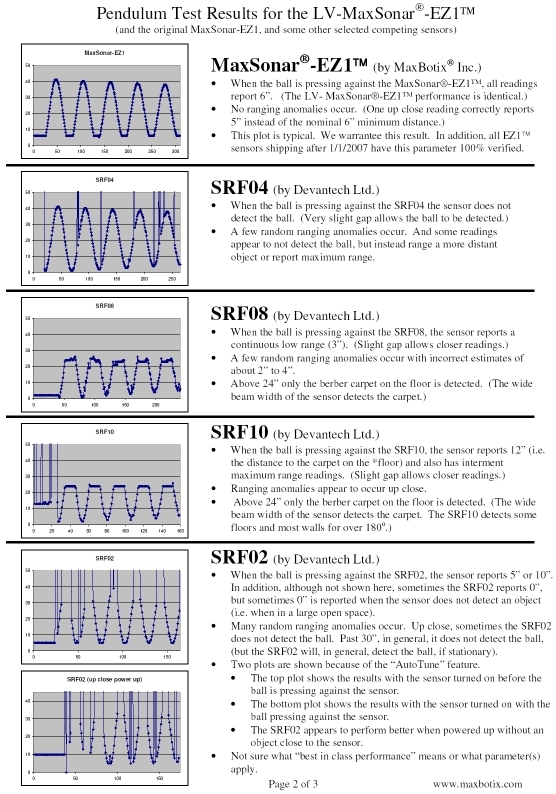 We will be testing the SRF01 and SRF05 against the LV-MaxSonar-EZ1 sensor in the future. The sensor gain needed to yield a beam width such that clutter outside of the central measurement area would be ignored, otherwise clutter outside the desired area could interfere with the actual distance readings. If the gain was increased too fast, then clutter outside of the central area could become a problem, causing false distance readings. If the gain was increased too slowly, then small objects would be missed. Also, the gain had to be increased correctly so even small objects would remain detected for the distances desired. In addition, unless the gain was increased smoothly, the transducer side lobes could interfere with the stable measurement goal. Yet if the gain increased by large steps, then very irregular, or oddly shaped beam patterns could be the result. And the gain needed to start very low, to provide detection of objects within the so-called dead band, yet it also needed to ramp up to whatever gain was needed. The LV‑MaxSonar‑EZ1 smoothly increases the gain yielding no dead band, excellent clutter rejection, small object detection, and the desired narrow beam. Thanks to the continuously variable gain, the beam shape can be programmed into the LV‑MaxSonar‑EZ1 sensor line. The beam pattern is a function of the amplifier gain, applied to the transducer gain (beam patterns). Beam patterns can be easily measured using standard targets, typically cylinders of a specific diameter. MaxBotix Inc chose three different cylinder diameters. The ¼’ dowel was chosen because many electrical cords are that diameter and if the LV‑MaxSonar‑EZ1 is to be used on a robot then this type of clutter must be detected. The 1” pole was chosen to simulate a table leg or similar shape, (but it also provides about the same return strength that a person returns). And the 3.5” diameter pole was chosen to provide an example of larger targets. The actual waveform returning from the echo needed to be analyzed. This greatly enhanced the ability of the LV‑MaxSonar‑EZ1 to reject non-probable targets and noise while still allowing the reliable detection of the actual desired targets. Verifying the actual performance of each LV‑MaxSonar‑EZ1 before it is bagged and shipped has always been applied to each product. At first, only a hand was moved slowly away from the sensor face. Distances of 0”, 6”, and 12” to the hand were verified, and 48” to the ceiling was verified, with a reading pulled out every second (only one in twenty readings) so it was easy to read. Now every LV‑MaxSonar‑EZ1 sensor must pass the swinging ball test where every reading is evaluated. Doing both of these tests confirms both the stability of the LV‑MaxSonar‑EZ1 and the full path, covering the sent “ping” to the returning echo, through the amplifier chain. Performance is 100% tested and guaranteed. This goal was very high up on the list. Too many sensors are sitting in a box because they were too hard to use. For ease of use, we provide three range outputs, all functioning at the same time. The analog voltage output can be easily verified with just a multimeter or can be easily matched to an AD converter. The pulse width output is very similar to many other low-cost sensors. The serial output is also available. In addition, the LV‑MaxSonar‑EZ1 can free run (the RX pin is high or open) or be commanded to take range readings (bring RX pin high when a range reading is desired). The LV‑MaxSonar‑EZ1 PCB remains the smallest mounted PCB for an ultrasonic range finder, and the provided mounting holes make mounting easy. We are smaller than other single sensor designs and believe the size is currently the smallest, practical, easy-to-use size. The weight is also very low at just 4.3 grams. Using low-cost components to build this sensor was desired because this would provide the sensor to the widest audience possible. Low-cost components were selected for use. Circuit designers know that this can be challenging, but it is possible. If it was possible to accomplish the above, then while doing so power consumption should be kept to a minimum. The low-cost components were also selected because of the low power draw they required. In addition, the circuit design was set up to have the lowest power draw possible, yet still provide the needed stability. The original LV‑MaxSonar‑EZ1 operates with 4.5V to 5.5V, and LV‑MaxSonar‑EZ1 extends the operating voltage range down to 2.5V allowing use in 3.3V systems (or 5V systems) and battery-powered sensors.